reading the posted trail guide. Trail maps are in the wooden box. Provincetown has nearly 8 miles of beautiful paved bicycle paths, winding through some of the most gorgeous scenery you'll ever bike through. Take your camera with you for the stunning photo opportunities you'll find all along the way. Back in the 1960s, about 4,000 acres of Provincetown's beaches, ponds, forests, sand dunes, wetlands, bogs and trails became part of the national park system. About 75% of Provincetown is now part of the Cape Cod National Seashore, and is open to recreation and exploration by the public. 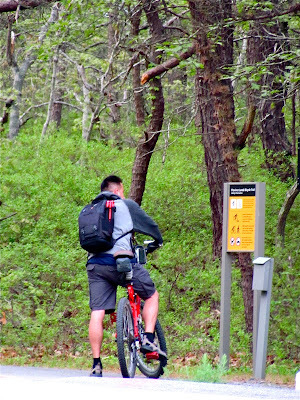 In addition to theses trails, there are other, unpaved trails through forested areas, suitable for mountain bikes. The Old Colony Nature Pathway is readily accessible from Howland Street, Snail Road, Mayflower Heights and Mount Gilboa Road. Many people ride on the roads and highways around town, and all along Route 6A, through the Beach Point area of North Truro, just south of PTown. Of course, every day in the summertime a few thousand people take their lives in their hands by riding along Commercial Street, which is an efficient, though sometimes frustrating way, to get around. The use of bicycles takes many cars off the road and eases traffic through town, but that still leaves so many cars on the streets in the summertime that bicycling can can be rather stop-and-go, while riders are dodging vehicles, pedestrians, skateboarders and baby carriages along the full length of the town's main thoroughfare. or sometimes in wooden boxes at the various trail heads. Click on it to enlarge. Biking on Commercial Street in the height of the summer season is not for the faint of heart, and has proven far too harrowing for many a would-be cyclist. Some of the bike trails can be challenging as well, with steep grades, sharp curves, and occasional flooding in underpasses and other low spots. Sand and other debris can blow onto the trails, making for dangerous conditions. For folks who simply want to enjoy the pleasure of a leisurely ride through wooded glades, that can be done by taking the shuttle bus or driving to Beech Forest, taking advantage of the free parking found there, and riding the short distance to Bennet Pond, or, in the other direction, to the Province Lands Visitor Center, which is well worth a stop. The visitor center is also a good spot to park for free, have a picnic, and go for a walk or ride on the bike trail. 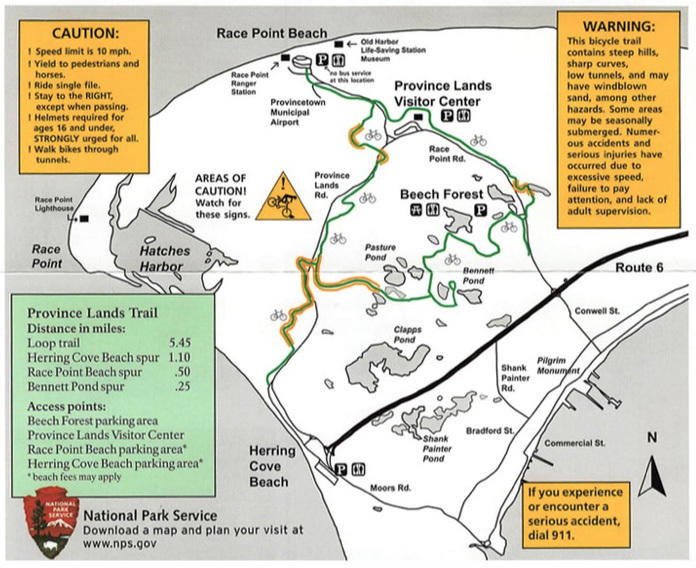 The parking areas at Race Point and Herring Cove beaches are also good access points for the trails, but you'll pay sizable fees to park there during the summer months. The cost of parking at the beaches can be avoided by taking your bike with you on the shuttle bus to either beach, but you'll want to be first in line to board the bus. Only two bikes at a time can be carried on the shuttle. you bike around town safely. 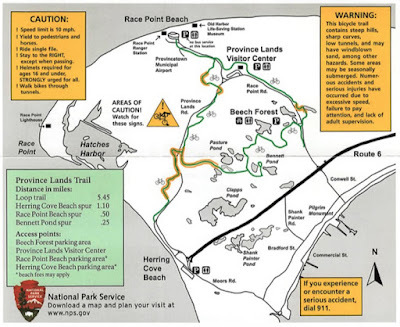 The National Park Service offers a trail map and safety guide with tips on riding and rules for these trails. Get this pamphlet, read it, and heed it. Serious accidents happen when bikers go too fast, or round a bend where accumulated wind-blown sand will stop their bike cold, sending the rider right over the handle bars. Helmets are required by law for riders age 16 and younger, and are highly recommended for anyone riding any of the streets or trails of Provincetown. The town also provides a bike map and safety guide, with a list of bike rental shops and locations, available at the Chamber of Commerce (on Lopes Square), at the Tourism Office (at the corner of Commercial and Freeman streets,) and in the literature display in the lobby at Town Hall, found at 260 Commercial Street. Sadly, the Outer Cape Bike Shuttle mentioned in this pamphlet is no longer in service. Bike rental shops are also likely to have maps, guides and safety information. Please… pay attention, ride safely, and don't be the cause of serious injury to yourself or others. Bicycling around here can be a good means of transportation through the town, and it can also be great fun. Getting out on the trails can be exhilarating, and can lead you to unparalleled scenic vistas, with stunning views all along the way. Enjoy your ride!